Friday, 10th Muharram, 61 A.H. In the House of the Holy Prophet, which presented the best image of both the worlds - the heaven and the earth- a child who benefited humanity as if he was a Divine Impression reflecting the earth, was born on one of the nights of the month of Sha'ban. His father was Imam 'Ali, the best model of kindness towards his friends and the bravest against the enemies of Islam, and his mother was Hadrat Fatimah, the only daughter and child of the Holy Prophet, who had as universally acknowledged, inherited the qualities of her father. Imam Husayn, is the Apostolic Imam. When the good news of his birth reached the Holy Prophet, he came to his daughter's house, took the newly-born child in his arms, recited adhan and iqamah in his right and left ears respectively, and on the 7th day of his birth, after performing the rites of 'aqlqah, named him al-Husayn, in compliance with Allah's command. 'Abdullah ibn 'Abbas relates: "On the very day when Imam Husayn was born, Allah ordered angel Gabriel to descend and congratulate the Holy Prophet on His Behalf and on his own. While descending, Gabriel passed over an island where the angel Futrus had been banished due to his delay in executing a commission assigned by Allah. He was deprived of his wings and expelled to the island where he remained for several years praying and worshipping Allah and asking for His forgiveness. "When the angel Futrus saw Gabriel, he called out, ' Where are you going, O Gabriel?' To this he replied, ' Husayn, the grandson of Muhammad is born, and for this very reason Allah has commanded me to convey His congratulations to His Apostle.' Thereupon, the angel said, ' Can you carry me also along with you? May Muhammad recommend my case to Allah.' Gabriel took the angel along with him, came to the Holy Prophet, offered congratulations to him on behalf of Allah and himself and referred the case of the angel to him. The Holy Prophet said to Gabriel, 'Ask the angel to touch the body of the newly-born child and return to his place in Heaven.' On doing this, the angle re-obtained his wings instantly and praising the Holy Prophet and his newly- born grandson, ascended towards the Heaven. Hasan and Husayn, the two sons of the Holy Imam 'Ali ibn Abi Talib and Hadrat Fatimah, our Lady of Light, were respected and revered as the 'Leaders of the Youths of Paradise' as stated by the Holy Prophet. The Holy Prophet Muhammad, peace be Upon him and his progeny, had openly prophesied that the faith of Islam would be rescued by his second grandson Husayn, when Yazid, son of Mu'awiayh, would endeavour to destroy it. Yazid was known for his devilish character and brutish conduct. He was known as the most licentious of men. The people having known and understood the character of Yazid, formed a covenant by which Mu'awiyah could not appoint Yazid as his successor. This undertaking was given by Mu'awiyah to Imam Hasan from whom Mu`awiyah had snatched power. Mu'awiyah violated this undertaking and nominated Yazid who succeeded his father. Immediately as he came to power, Yazid began acting in full accordance with his known character. He started interfering in the fundamentals of the faith and practiced every vice and wickedness freely with the highest degree of impunity and yet held himself out as the successor of the Holy Prophet, demanding allegiance to himself as the leading guide of the faith. Paying allegiance to Yazid was nothing short of acknowledging the devil as Cod. If a divine personality like the holy Imam Husayn had agreed to his authority, it would be actually recommending the devil to humanity in place of Cod. Yazid demanded allegiance from the Holy Imam Husayn, who could have never agreed to it at any cost. The people fearing death and destruction at the hands of the tyrant had yielded to him out of fear. Imam Husayn said that come what- ever may, he would never yield to the devil in place of God and undo what his grandfather, the Holy Prophet had established. The refusal of the Holy Imam to pay allegiance to this fiend, marked the start of the persecution of the Holy Imam. As a result he had retired to Medina where he led a secluded life. Even here he was not allowed to live in peace, and was forced to seek refuge in Mecca where also he was badly harassed, and Yazid plotted to murder him in the very precincts of the great sanctuary of Ka'bah. Husayn knew the ultimate end of the invitations, he as the divinely chosen Imam could not refuse to give the guidance sought for. When the Holy Imam with his entourage had reached karbala', his horse mysteriously stopped and would not move any further. Upon this the holy Imam declared: "This is the land, the land of sufferings and tortures." He alighted from his horse, and ordered his followers to encamp there saying: Here shall we be martyred and our children be killed. Here shall our tents be burned and our family arrested. This is the land about which my grandfather the Holy Prophet had foretold, and his prophecy will certainly be fulfilled." On the 7th of Muharram water supply to the lmam's carnp was cut and the torture of thirst and hunger started. the holy Imam's camp consisted of ladies, innocent children including babies and some male members of the Holy prophet's family; along with a small band of some faithful friends of Imam Husayn who had chosen to die with the Holy Imam, fighting against the devil for the cause of Allah. At dawn the Imam glanced over the army of Yazid and saw 'Umar ibn Sa'd ordering his forces to march to- wards him. He gathered his followers and addressed them thus: "Allah has, this day, permitted us to be engaged in a Holy War and He shall reward us for our martyrdom. So prepare yourselves to fight against the enemies of Islam with patience and resistance. O sons of the noble and self-respecting persons, be patient ! heath is nothing but a bridge which you must cross after facing trials and tribulations so as to reach Heaven and its joys. Which of you do not like to go from this prison (world) to the lofty palaces (Paradise ) ? " Having heard the Imam's address, all his companions were overwhelmed and cried out, "O our Master! 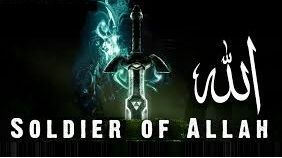 We are ail ready to defend you and your Ahlu 'I-hayt, and to sacrifice our lives for the cause of Islam." Imam Husayn sent out from his camp one after an- other to fight and sacrifice their lives in the way of the Lord. Lastly, when all his men and children had laid down their lives, Imam Husayn brought his six-month old baby son 'Ali al-Asghar, and offering him on his own hands, demanded some water for the baby, dying of thirst. The thirst of the baby was quenched by a deadly poisoned arrow from the brute's forces, which pinned the baby's neck to the arm of the helpless father. At last when the six-month old baby also was killed, Imam Husayn addressed Allah: "O Lord! Thy Husayn has offered in Thy way whatever Thou hath blessed him with. Bless Thy Husayn, O Lord! with the acceptance of this sacrifice. Everything Husayn could do till now was through Thy help and by Thy Grace." Lastly, Imam Husayn came into the field and was killed, the details of which merciless slaughter are heart rending. The forces of Yazid having killed Imam Husayn, cut and severed his head from his body and raised it on a lance. The severed head of the Holy Imam began glorifying Allah from the point of the lance saying, 'Allahu Akbar'. "All glory be to Allah Who is the Greatest!" After the wholesale, merciless and most brutal slaughter of the Holy Imam with his faithful band, the help- less ladies and children along with the ailing son of Imam Husayn, Imam 'Ali Zaynu 'l-'Abidin, were taken captives. 1. Hasan and Husayn are the Leaders of the Youths of Paradise. 2. Husayn is from me and I am from Husayn, Allah befriends those who befriend Husayn and He is the enemy of those who bear enmity to him. 3. Whosoever wishes to see such a person who lives on earth but whose dignity is honoured by the Heaven- dwellers, should see my grandson Husayn. 4. O my son! thy flesh is my flesh and thy blood is my blood; thou art a leader, the son of a leader and the brother of a leader; thou art a spiritual guide, the son of a spiritual guide and the brother of a spiritual guide; thou art an Apostolical Imam, the son of an Apostolical Imam and the brother of an Apostolical Imam; thou art the father of nine Imams, the ninth of whom would be the Qa'im (the last infallible spiritual guide). 5. The punishment inflicted on the murderer of Husayn in Hell would be equal to half of the total punishment to be imposed on the entire sinners of the world. 6. When the Holy Prophet informed Hadrat Fatimah of the martyrdom in store for his grandson, she burst into tears and asked, "O my father ! when would my son be martyred?" "In such a critical moment," replied the Holy Prophet, "When neither I nor you, nor 'ALI would be alive." This accentuated her grief and she inquired again, "Who then, O my father, would commemorate Husayn's martyrdom? " The Holy Prophet said, "The men and the women of a particular sect of my followers, who will befriend my Ahlul-Bayt, will mourn for Husayn and commemorate his martyrdom each year in every century." Imam 'Ali, while on his way to Siffin, passed through the desert of Karbala', there he stopped and wept very bitterly. When interrogated regarding the cause of his weeping, he commented that one day he visited the Holy Prophet and found him weeping. When he asked the Apostle of Allah as to what was the reason which made him weep, he replied, "O 'ALI, Gabriel has just been with me and informed me that my son Husayn would be martyred in Karbala', a place near the bank of the River Euphrates. This moved me so much that I could not help weeping." One day the Holy Prophet ascended the pulpit to deliver a sermon to his associates while Imam Husayn and Imam Hasan were sitting before him. When his address was over, he put his left hand on Imam Husayn and raising his head towards Heaven, said: "O my Lord! I am Muhammad Thy slave and Thy Prophet, and these two are the distinguished and pious members of my family who would fortify my cause after me. O my Lord! Gabriel has in- formed me that my son Husayn would be killed. O my Lord! bless my cause in recompense for Husayn's martyrdom, make him the leader of the martyrs, be Thou his helper and guardian and do not bless his murderers." Imam Husayn uprooted despotism forever till the Day of Resurrection. He watered the dry garden of freedom with the surging wave of his blood, and indeed he awakened the sleeping Muslim nation. If Imam Husayn had aimed at acquiring a worldly empire, he would not have traveled the way he did (from Medina to Karbala'). Husayn weltered in blood and dust for the sake of truth. Verily he, therefore, became the bed-rock (foundation) of the Muslim creed; la ila ha illai Allah (There is no god but Allah). He gave his head, but did not put his hand into the hands of Yazid. Verily, Husayn is the foundation of la ila ha illa Allah. Husayn is lord and the lord of lords. Husayn himself is Islam and the shield of Islam. Though he gave his head (for Islam) but never pledged Yazid. Truly Husayn is the founder of "There is no Deity except Allah." As a reminder, the blood-stained field of Karbala' where the grandson of the Apostle of God fell at length, tortured by thirst and surrounded by the bodies of his murdered kinsmen, has been at any time since then sufficient to evoke, even in the most lukewarm and heedless, the deepest emotion, the most frantic grief and the exaltation of spirit before which pain, danger, and death shrink to unconsidered trifles. Yearly, on the tenth day of Muharram, the tragedy is rehearsed in Persia, in India, in Turkey, in Egypt and many other places. As I write it all comes back; the wailing chant, the sobbing multitudes, the white raiment red with blood from self inflicted wounds, the intoxication of grief and sympathy. Imam Husayn (Sayyidu sh- Shuhada', "the lord among martyrs"), the second child of 'ALI and Fatimah, was born in the year 4 A H, and after the martyrdom of his brother, Imam Hasan Mujtaba, became Imam through Divine Command and his brother's will. Imam Husayn was Imam for a period of ten years, all but the last six months coinciding with the caliphate of Mu'awiyah. Imam Husayn lived under the most difficult outward conditions of suppression and persecution. This was due to the fact that, first of all, religious laws and regulations had lost much of their weight and credit, and the edicts of the Umayyad government had gained complete authority and power. Secondly, Mu'awiyah and his aides made use of every possible means to put aside and move out of the way the Household of the Prophet, and thus obliterate the name of 'Ali and his family. And above all, Mu'awiyah wanted to strengthen the basis of the caliphate of his son, Yazid. who because of his lack of principles and scruples was opposed by a large group of Muslims. Therefore, in order to quell all opposition, Mu'awiyah had undertaken newer and more severe measures. By force and necessity Imam Husayn had to endure these days and to tolerate every kind of mental and spiritual agony and affliction from Mu'awiyah and his aides-until in the middle of the year 60 AH, Mu'awiyah died and his son Yazid took his place. Paying allegiance (bay'ah) was an old Arab practice which was carried out in important matters such as that of kingship and governmentship. Those who were ruled, and especially the well-known among them, would give their hand in allegiance, agreement and obedience to their king or prince and in this way would show their support for his actions. Disagreement after allegiance was considered as disgrace and dishonour for a people and, like breaking an agreement after having signed it officially, it was considered as a definite crime. Following the example of the Holy Prophet, people believed that allegiance, when given by free will and not through force, carried authority and weight. Mu'awiyah had asked the well-known among the people to give their allegiance to Yazid, but had not imposed this request upon Imam Husayn. He had especially told Yazid in his last will that if Husayn refused to pay allegiance he should pass over it in silence and overlook the matter, for he had understood correctly the disastrous consequences which would follow if the issue were to be pressed. But because of his egoism and recklessness, Yazid neglected his father's advice and immediately after the death of his father ordered the governor of Medina either to force a pledge of allegiance from Imam Husayn or send his head to Damascus. After the governor of Medina informed Imam Husayn of this demand, the Imam, in order to think over the question, asked for a delay and overnight started with his family toward Mecca. He sought refuge in the sanctuary of God which in Islam is the official place of refuge and security. This event occurred toward the end of the month of Rajab and the beginning of Sha'ban of 60 AH. For nearly four months Imam Husayn stayed in Mecca in refuge. This news spread throughout the Islamic world. On the one hand many people who were tired of the iniquities of Mu'awiyah's rule and were even more dissatisfied when Yazid became caliph, corresponded with Imam Husayn and expressed their sympathy for him. On the other hand, a flood of letters began to flow, especially from Iraq and particularly the city of Kufah, inviting the Imam to go to Iraq and accept the leadership of the populace there with the aim of beginning an uprising to overcome injustice and iniquity. Naturally, such a situation was dangerous for Yazid. The stay of Imam Husayn in Mecca continued until the season for pilgrimage when Muslims from all over the world poured in groups into Mecca in order to perform the rites of the hajj. The Imam discovered that some of the followers of Yazid had entered Mecca as pilgrims (hajj) with the mission to kill the Imam during the rites of hajj with the arms they carried under their special pilgrimage dress (Ehram). The Imam shortened the pilgrimage rites and decided to leave. Amidst the vast crowd of people he stood up in a short speech announced that he was setting out for Iraq. In this short speech he also declared that he would be martyred and asked Muslims to help him in attaining the goal he had in view and to offer their lives in the path of God. On the next day he set out with his family and a group of his companions for Iraq. Imam Husayn was determined not to give his allegiance to Yazid and knew full well that he would be killed. He was aware that his death was inevitable in the face of the awesome military power of the Umayyads, supported as it was by corruption in certain sectors, spiritual decline, and lack of will power among the people, especially in Iraq. Some of the outstanding people of Mecca stood in the way of Imam Husayn and warned him of the danger of the move he was making. But he answered that he refused to pay allegiance and give his approval to a government of injustice and tyranny. He added that he knew that wherever he turned or went he would be killed. He would leave Mecca in order to preserve the respect for t}abuse of God and not allow this respect to be destroyed by having his blood spilled there. While on the way to Kufah and still a few days journey away from the city, he received news that the agent of Yazid in Kufah had put to death the representative of the Imam in that city and also one of the Imam's determined supporters who was a well-known man in Kufah. Their feet had been tied and they had been dragged through the streets. The city and its surroundings were placed under strict observation and countless soldiers of the enemy were awaiting him. There was no way open to him but to march ahead and to face death. It was here that the Imam expressed his definitive determination to go ahead and be martyred; and so he continued on his journey. Approximately seventy kilometers from Kufah in a desert named Karbala', the Imam and his entourage were surrounded by the army of Yazid. For eight days they stayed in this spot during which the circle narrowed and the number of the enemy's army increased. Finally the Imam, with his Household and a small number of companions were encircled by an army of thirty thousand soldiers. During these days the Imam fortified his position and made a final selection of his companions. At night he called his companions and during a short speech stated that there was nothing ahead but death and martyrdom. He added that since the enemy was concerned only with his person he would free them from all obligations so that anyone who wished could escape in the darkness of the night and save his life. Then he ordered the lights to be turned out and most of his companions, who had joined him for their own advantage, dispersed. Only a handful of those who loved the truth about forty of his close aides and some of the Banu Hashim remained. Once again the Imam assembled those who were left and put them to a test. He addressed his companions and Hashimite relatives, saying again that the enemy was concerned only with his person. Each could benefit from the darkness of the night and escape the danger. But this time the faithful companions of the Imam answered each in his own way that they would not deviate for a moment from the path of truth of which the Imam was the leader and would never leave him alone. They said they would defend his Household to the last drop of their blood and as long as they could carry a sword. On the ninth day of the month the last challenge to choose between "allegiance or war" was made by the enemy to the Imam. The Imam asked for a delay in order to worship overnight and became determined to enter battle on the next day. On the tenth day of Muharram of the year 61(680) the Imam lined up before the enemy with his small band of followers, less than ninety persons consisting of forty of his companions, thirty some members of the army of the enemy that joined him during the night and day of war, and his Hashimite family of children, brothers, nephews, nieces and cousins. That day they fought from morning until their final breath, and the Imam, the young Hashimites and the companions were all martyred. Among those killed were two children of Imam Hasan, who were only thirteen and eleven years old; and a five-year-old child and a suckling baby of Imam Husayn. The army of the enemy, after ending the war, plundered the haram of the Imam and burned his tents. They decapitated the bodies of the martyrs, denuded them and threw them to the ground without burial. Then they moved the members of the haram, all of whom were helpless women and girls, along with the heads of the martyrs, to Kufah. Among the prisoners there were three male members: a twenty-two years old son of Imam Husayn who was very ill and unable to move, namely, 'Ali ibn al-Husayn, the fourth Imam; his four years old son, Muhammad ibn 'Ali, who became the fifth Imam; and finally Hasan al-Mujtaba, the son of the second Imam who was also the son-in-law of Imam Husayn and who, having been wounded during the war, lay among the dead. They found him near death and through the intercession of one of the generals did not cut off his head. Rather, they took him with the prisoners to Kufah and from there to Damascus before Yazid. The event of Karbala', the capture of the women and children of the Household of the Prophet, their being taken as prisoners from town to town and the speeches made by the daughter of 'Ali, Zaynab, and the fourth Imam who were among the prisoners, disgraced the Umayyads. Such abuse of the Household of the Prophet annulled the propaganda which Mu'awiyah had carried out for years. The matter reached such proportions that Yazid in public disowned and condemned the actions of his agents. The event of Karbala' was a major factor in the overthrow of Umayyad's rule although its effect was delayed. Among its immediate results were the revolts and rebellions combined with bloody wars which continued for twelve years. Among those who were instrumental in the death of the Imam not one was able to escape revenge and punishment. Anyone who studies closely the history of the life of Imam Husayn and Yazid and the conditions that prevailed at that time, and analyses this chapter of Islamic history, will have no doubt that in those circumstances there was no choice before Imam Husayn but to be killed. Swearing allegiance to Yazid would have meant publicly showing contempt for Islam, something which was not possible for the Imam, for Yazid not only showed no respect for Islam and its injunction but also made a public demonstration of impudently treading under foot its basis and its laws. Those before him, even if they opposed religious injunctions, always did so in the guise of religion, and at least formally respected religion. They took pride in being companions of the Holy Prophet and the other religious figures in whom people believed. From this it can be concluded that the claim of some interpreters of these events is false when they say that the two brothers, Hasan and Husayn, had two different tastes and that one chose the way of peace and the other the way of war, so that one brother made peace with Mu'awiyah although he had an army of forty thousand while the other went to war against Yazid with an army of forty. For we see that this same Imam Husayn, who refused to pay allegiance to Yazid for one day, lived for ten years under the rule of Mu'awiyah, in the same manner as his brother who also had endured for ten years under Mu'awiyah, without opposing him. It must be said in truth that if Imam Hasan or Imam Husayn had fought Mu'awiyah they would have been killed without there being the least benefit for Islam. Their deaths would have had no effect before the righteous appearing policy of Mu'awiyah, a competent politician who emphasized his being a companion of the Holy Prophet, the "scribe of the revelation," and "uncle of the faithful" and who used every stratagem possible to preserve a religious guise for his rule. Moreover, with his ability to set the stage to accomplish his desires he could have had them killed by their own people and then assumed a state of mourning and sought to revenge their blood, just as he sought to give the impression that he was avenging the killing of the caliph. Beware of your apologies; for a true believer does not sin and does not have to apologize, whereas the hypocrite commits sins everyday and apologizes everyday. When other people turn to you in need, consider it a favour of Allah. Do not be wearied of this favour, or it will move on to someone else. Today, there have been 102 visitors (214 hits) on this page!